Blackpool twice came from behind to defeat Cardiff and reach the Premier League for the first time after an engaging and, at times, breathtaking final at a sun-soaked Wembley. The Tangerines won 3-2, with all the goals coming during an opening half of unbelievable excitement aided in part by some awful defending. The result completes a remarkable season for Blackpool, who can now plan for a top-flight campaign for the first time since 1971. It also caps a sensational first season in charge for Ian Holloway, who has stuck to his attacking principles all year and did so again at Wembley by sending his team out in a bold 4-3-3 formation. Blackpool will arguably be the smallest club to have played in the Premier League, but they can now look forward to rubbing shoulders with English football's elite after winning a game whose value is estimated to be £90m. The result was perhaps a little harsh on Cardiff, who struck the woodwork twice through Michael Chopra. The Bluebirds had the better of the second half but, after one of the most scintillating opening periods in play-off history, they could not find an equaliser. Cardiff's aim of becoming the first Welsh club to play Premier League football is on hold for at least one more season and, perhaps more tellingly, leaves the club facing some tough issues over the summer. They have survived several High Court winding-up orders over the season and have estimated debts of £15m as a Malaysian consortium prepare to invest in the club with Peter Ridsdale standing down as chairman. The match could not have started much better for the Welsh side, who laid down an early marker of intent when Chopra got across Alex Baptiste to toe-poke a cross from Peter Whittingham that smashed against the crossbar after just four minutes. Chopra, a lively and industrious presence throughout, had the Bluebirds in front five minutes later when he perfectly timed his run to stay onside before collecting Whittingham's threaded through ball and drilling his angled shot into the bottom corner. Cardiff looked capable of taking a firm stranglehold on the final but the inspirational Adam quickly restored parity with his left-foot free-kick over the Cardiff wall. And the match took another twist when the influential Jay Bothroyd, who had already found plenty of space in wide areas, limped off to be replaced by Kelvin Etuhu. Pool enjoyed a period of dominance as the Bluebirds tried to come to terms with their double blow, but Stephen Crainey shot wide and DJ Campbell, who scored a hat-trick in the play-off semi-final second leg against Nottingham Forest, failed to connect with a precise low cross. It was developing into a pulsating encounter and Chopra might have restored Cardiff's lead from Whittingham's floated cross but the striker scuffed his volley. Ledley, out of contract this summer, had been relatively anonymous but he collected a delicious return pass from Whittingham before striking the ball beyond Matt Gilks, who got his angles wrong as he advanced out of goal. Cardiff's joy was again short-lived. Taylor-Fletcher struck the post from 20 yards after 39 minutes but a minute later he stabbed home from a corner after Mark Kennedy had cleared Ian Evatt's initial effort off the line. 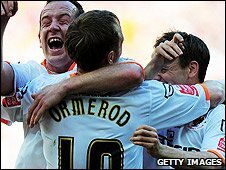 And in first-half injury-time Campbell slipped as he attempted to shoot but the ball ran to Ormerod, who shot beyond David Marshall to put Pool 3-2 up at the end of a breathtaking half. Cardiff defender Darcy Blake had the ball in the net before the interval but his effort was quite correctly ruled out for offside. Blackpool, fearless to the last, continued to attack after the break and the Tangerines should perhaps have made more from an early promising position but Taylor-Fletcher delayed his pass and Campbell's eventual shot was blocked. Taylor-Fletcher was replaced by striker Ben Burgess after 53 minutes and shortly afterwards Holloway brought on another forward, Stephen Dobbie, for Ormerod. There were signs of frustration from the Cardiff players, a feeling that only increased after Chorpa collected a pass from Chris Burke and drilled another strike against the woodwork. Ledley went close after beating the unsure Gilks to a corner at the near post but his header flew narrowly wide, while Etuhu drew a save from the Tangerines keeper as the Bluebirds mounted a sustained period of pressure. The second half lacked the you score, we score, theatre of the opening 45 minutes but as the match moved into the final 20 minutes of normal time, the players started to tire in the heat and there was an increasing sense of anxiety emanating from the stands. Gilks dropped a cross under pressure from Chopra, with the ball almost running into his own net, but it was Pool who had the better of the late chances as they tried to hit their opponents on the break. Poor decision making prevented Holloway's team from scoring a fourth but they closed out the match to seal their place in the top flight next season.